Digitization help student to explore and study their academic courses online, as this gives them flexibility and scheduling their learning at their convenience. Kidsfront has prepared unique course material of Reasoning Seating Arrangements for Territorial Army Officers Exam student. This free online Reasoning study material for Territorial Army Officers Exam will help students in learning and doing practice on Seating Arrangements topic of Territorial Army Officers Exam Reasoning. The study material on Seating Arrangements, help Territorial Army Officers Exam Reasoning students to learn every aspect of Seating Arrangements and prepare themselves for exams by doing online test exercise for Seating Arrangements, as their study progresses in class. Kidsfront provide unique pattern of learning Reasoning with free online comprehensive study material and loads of Territorial Army Officers Exam Reasoning Seating Arrangements exercise prepared by the highly professionals team. Students can understand Seating Arrangements concept easily and consolidate their learning by doing practice test on Seating Arrangements regularly till they excel in Reasoning Seating Arrangements. In a class Rajan got the 11th rank and he was 31st from the bottom of the list of boys passed. Three boys did not take the examination and one failed. What is the total strength of the class ? Solution Is : Number of passed boys in the class = 11 + 31 - 1 = 41 Hence, total number of strength of the class = 41 + 3 - 1 = 41. Five friends are sitting in a row facing South. Here Mohan is between Balu and Raju is to the immediate right of Praveen and Amith is to the right of Balu. Who is in extreme right end ? Susma scored more than Deepak. Rushil scored as much as Ansh. Samhita scored less than Vasavi. Deepak scored more than Rushil. Vasavi scored less than Ansh. Q.Who scored the lowest ? In a row of houses, the house with a terrace is 25th from left end 4th from the right end. How many houses are there in the row ? 6 persons are playing a card game. Suresh is facing Rahubir Who is left to Ajay and to the right of Pramod, Ajay is to the left of Dhiraj. Yogendra is to be left of Pramod. 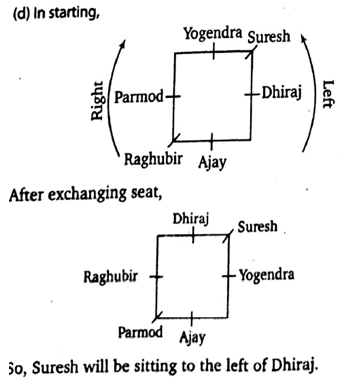 If Dhiraj exchanges his seat with Yogendra and Pramod with Raghubir, Who will be sitting to the left of Dhiraj? Q.There are five houses A, B, C, D, O in a row. A is right side of B and left side of C. O is in the right side of A. 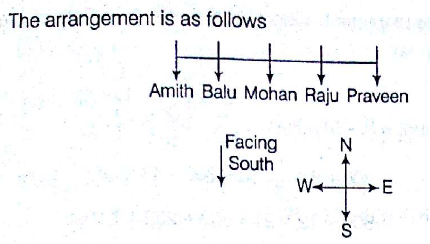 B is right of D. Which house is in the middle ? Six friends A, B, C, D, E and F are sitting in a row facing East.`C` is between`A` and`E`.`B` is just to the right of`E` but left of`D`.`F` is not at the right end. How many persons are to the right of`E`? A , B , C, D , E and F are sitting in a circle facing towards centre . D is between F and B . A is second to the left of D and second to the right of E . Who is facing towards D ? Sohan ranks seventh from the top and twenty sixth from the bottom in a class. How many students are there in the class? In a gathering seven members are sitting in a row.`C` is sitting left to`B` but on the right to`D`.`A` is sitting right to`B`.`F` is sitting right to`E` but left to`D`.`H` is sitting left to`E`. Find the person sitting in the middle.